'Tis the Season to be Enchanted! 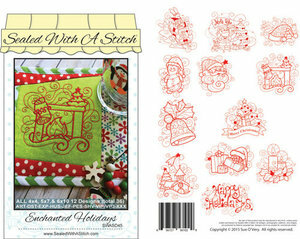 Fun Holiday redwork designs ready for that most special time of the year. Designs include: Santa, Mrs. Clause, & Rudolph on a sled, Santa & Mrs. Clause at the North Pole, Enchanted Santa hat, Cute Penguin with holiday hat, Santa with swirly beard, Warm firm with Christmas tree and stocking, Holly and bell, Merry Christmas banner with Tree and Gift, Holiday Church scene, Holiday gifts and hat, Holly and candles, and Happy Holidays with Christmas lights.